Qmani uses its best efforts to ensure your usage of our products is secure and reasonable steps are taken to protect your information. No data transmission over the Internet or information storage technology can be guaranteed to be 100% secure. Qmani has implemented measures to ensure you have a safe and comfortable experience when using our products. Qmani will continually evaluate and implement enhancements in security technology and practices. However we can only take steps to help reduce the risks of unauthorized access. Note: Each individual using the Internet can take steps to reduce their security risk when on-line and help protect their information and further minimize the likelihood that a security incident may occur. For useful guidance and tips on your individual information security usage, please refer to the links to information provided by your ISP, organization, legislative bodies and industry advisory groups. Qmani uses SSL (Secure Socket Layer) encryption when transmitting certain kinds of information, such as financial services information or payment information. An icon resembling a padlock is displayed on the bottom of most browser's window during SSL transactions that involve credit cards and other forms of payment. For credit card number for payment or for verification purposes, it will be SSL encrypted. The information you provide will be stored securely on our servers or on external payment gateway services. Qmani has implemented a range of IP security to authenticate external servers and interfaces including one-way encryption for userid and password information. An externally signed 128-bit encryption certificate is used by Qmani. Qmani may use a Security Key as an additional optional layer of security to control access to sensitive information or services for Qmani products. Qmani maintains reasonable physical, electronic, and procedural safeguards that comply with industry guidelines and regulations to protect messaging and personal information. Qmani limits access to personal information about you to those employees who we reasonably believe need to come into contact with that information to provide products or services to you or in order to do their jobs. If Qmani receives a statutory request from the proper Federal or State authorities to forward specific information, we are obliged by law to comply accordingly. Qmani works with vendors and partners to protect the security and privacy of user information. Qmani continues to provide company-wide education and training program about security to its staff and associates. 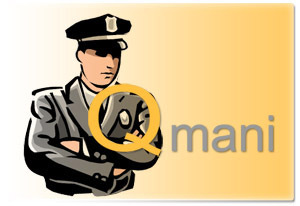 If you believe your Qmani account has been compromised, please report the incident using our Qmani Support contact form on www.qmani.com or call our Qmani Support and advise that you are reporting a serious incident. If you receive email forgeries or have been contacted maliciously by someone about your Qmani account asking for a password, birth date or other personal information, please forward the email to security@qmani.com. Please include the full headers and the HTML source code of the email you received. If you are a member of the security community and need to report a technical vulnerability, contact: security@qmani.com. In the event that you believe that your personal safety is at risk or if you believe that you may be the victim of identity theft or other illegal conduct, please contact the appropriate Federal or State police or regulatory bodies directly.